Rating: 5/5 – Four Origins That Add to Phantom Stranger’s Legacy. The creative lineup for this issue of Secret Origins includes names such as Alan Moore, Jim Aparo, Jose Luis Garcia-Lopez, Joe Orlando and Ernie Colon. This issue of Secret Origins’ talent roster is really something special and the stories and art that are produced by these talents live up to, and even exceeded my reputations. 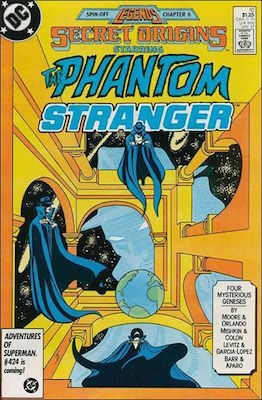 Secret Origins number ten is a spotlight on Phantom Stranger. A couple weeks back I reviewed the Silver Age reintroduction of the character so I’ve been on a bit of a Phantom Strange kick. In that review I had mentioned that the Phantom Stranger’s origin had never quite been defined up until the New 52 version of the character. Instead, the character has had multiple interpretations of his origin, providing a mystery around the character and where he came from. This issue of Secret Origins embraces the mystery and takes it one step further by having four different stories by four different creative teams, each presenting a different take on the character’s origin with the first of the four stories being my personal favorite. “Tarry till I Come Again” is written by Mike W. Barr and drawn by the amazing Jim Aparo. The opening splash page has the Phantom Stranger standing in front of a silhouette of Jesus hanging from the cross on Mt. Sinai, then quickly moves to the current day with Phantom Stranger inside a church asking for confession. This confession is where the Stranger explains that after King Herod kills his young child and wife, he bribes a soldier to be able to whip Jesus before he’s nailed to the cross. It’s a powerful story in words and Aparo’s art as he conveys all the emotion and anger in the young Stranger’s face. Each story is resolved in its ten pages so you get enough to tell a complete tale in each chapter and the ending here is as solid as the rest of the story. Paul Levitz and Jose Garcia Lopez’s second story is titled “…and Men Shall Call him Stranger”. In this origin tale, the Stranger is an honest and honorable man living in a city that’s full of sin and morally corrupt society. Before the city is destroyed by the hands of God, an angel visits the stranger and offers salvation. Instead of being saved, the Stranger chooses to stay and save all those he can. It’s another powerful story that highlights Garcia-Lopez’s abilities to draw the human form and give his characters dynamic poses. After a third story that’s a bit weak in comparison to the rest, Alan Moore and Joe Orlando finish the issue with a tale called “Footsteps”. One of the greatest writers in the medium telling an origin tale about one of DC’s oldest characters is reason enough to seek out this issue. Moore and Orlando shine in jumping back and forth between a group of homeless people living beneath the city and the Strfanger’s journey between heaven and hell and his meeting with Satan. Four stories by four great creative teams including some of the best who have ever worked in the medium should have you searching out and reading this issue. It’s not a definitive origin for the character, but instead four interpretations of the character’s origin that add to his legacy and make him more interesting and compelling because of it. This issue can be found in many places for just a couple dollars and that is definitely a bargain for the quality found within. This entry was posted in comic book, comics, DC, DC Comics and tagged Alan Moore, comic books, comics, DC Comics, Jim Aparo, Joe Orlando, Jose Luis Garcia Lopez, Mike Barr, Paul Levitz, Phantom Stranger, Secret Origins, vintage comics. Bookmark the permalink.